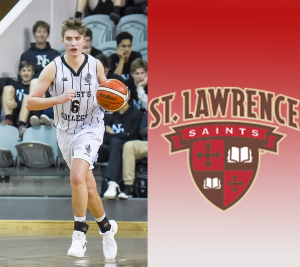 Congratulations to Will Harrison from Christs College who committed earlier in the year to a scholarship to attend St Lawrence University where he will study business and continue his basketball career. St Lawrence is New York’s oldest co-ed university and is recognised as being in the top 50 liberal arts colleges in the USA. The Princeton Review selected St. Lawrence University in its 50 universities that launch careers with its alumni network ranked 3rd in the country. The St Lawrence Saints play in the Liberty League in NCAA Div 3. Will will be playing for Coach Downs who has been at the helm of the St. Lawrence University men’s basketball program for 21 seasons. He is St. Lawrence’s all-time winningest coach and has guided the Saints to multiple NCAA Tournaments with appearances in the Elite 8 and Sweet 16. “My priority was to go to a university that was academically recognised and would put me in the best position possible career wise after I graduate and St Lawrence definitely delivers on that. Coach Downs and Coach Begley were then instrumental in differentiating St Lawrence from other comparable colleges that were interested in me. Being so far away from home, they gave me a lot of comfort explaining to me their plans for the team and how I would fit, ensuring I could get all the information about St Lawrence I needed to make an informed decision, and just generally made me, and most importantly my mother, feel very confident in making the decision.”, said Will. Will heads over to commence his 4 years at St Lawrence in August.